Over the last 80 years, Mansfield has developed a reputation as a favorite of trade professionals of all kinds. From commercial and residential builders and contractors to plumbers and facility managers, everyone appreciates the quality, service and value of Mansfield. 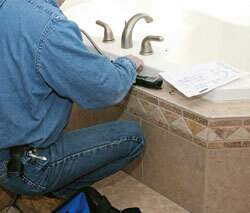 Our residential product line includes coordinating toilets, lavatories, soaker tubs, whirlpools, air massage baths. We also offer commercial products for a wide variety of applications, from elegant models ideal for the hospitality industry, to bariatric and BPL models for health care facilities, to high efficiency products eligible for LEED credits. Whether you need products at opening price points, builder grade or our sophisticated Affordable Style suites, Mansfield offers products for every budget. Mansfield offers more than just good looks. Backed by extensive warranties, you can count on reliable performance for years. When you do have a question or a concern, our customer service is efficient and helpful, managing your issue and keeping your project moving. Our shorter lead times and consistent availability also keep your projects on time and on budget. With 95% of our products made in the USA, we maintain control of the manufacturing process for the highest quality at competitive prices. Download Mansfield’s high quality CAD drawings, BIM objects, Revit files, and related documents for your next project. When you sign up for Supply Lines emails, you’ll definitely stay informed – and you just might get some extra Mansfield gear as well. Enter your email address to be automatically entered for a chance to win. And feel free to share this offer with your colleagues.